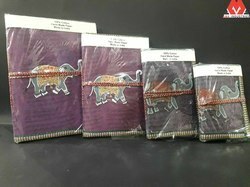 avyaye creation brings you a awesome range of sagun envelope. Sagun lisas lifafa for every occasion like-Wedding, Reception, Sagai, cocktail, birthday, teej, rakhi, bhaiya dooj, diwali, navratre, new born baby, marriage, eid and corporate bonus. We offer Hand Made Envelope in designer fabric envelope. 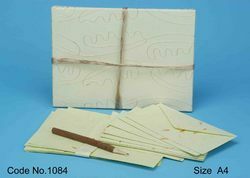 We are the manufacturers and wide offerings of Handmade Paper Products. We are engaged in offering high quality paper. diaries are designed using quality Paper Handicraft and are widely used as promotional purposes. Express your feelings in an ambiance of grace and style. These handmade notebooks feature overlapping cover with golden border and string lock. Striking as well as long lasting, these notebooks are encountering wide demand in the market. The inside paper are cut into a shape and the protuding part of the paper are used as a tunnel and the thread is passed through this tunnel.THe cover is of metallic leatherite paper and is printed with hand block.The outline of the print has been further decorated with silver outline hand work. Made with hard bound handmade paper our stationery items are a pleasure to use. We have a large variety of letter heads, business cards, office stationery, notebooks, journals, drawing portfolios, Art books etc. All the items are of high quality paper and match international standards.